Theresa May has won the Tory confidence vote in her leadership by 200 to 117. The figure of 117 out of 317 Conservative MPs voting against the Prime Minister in the secret ballot is not expected to lead to her resignation as leader, but is a higher number than expected. More than double the threshold of MPs required to trigger the no-confidence vote, which stood at 48 this morning, cast a ballot saying they had no confidence in May as leader. The figure of 117 is also notably higher than the number of European Research Group members, which indicates that concern over May’s leadership goes beyond the opposition of hard Brexiteers in the Conservative Party. However, under party rules, Tory MPs will not be able to trigger another leadership election until 12th December 2019, so opponents wishing to force May out will have to rely on her deciding to step down. Commenting on the result, Jeremy Corbyn said: “Tonight’s vote makes no difference to the lives of our people. “The Prime Minister has lost her majority in parliament, her government is in chaos and she is unable to deliver a Brexit deal that works for the country and puts jobs and the economy first. Shocking result for Theresa May. Even having offered to go before the next general election she still has a huge 117 Tory MPs, a third of her party, voting against her and not having confidence in her. Wow. Jacob Rees-Mogg, as a hard Brexiteer who has led calls for May to step down, said it was a “terrible result for the Prime Minister”. In the 1922 Committee meeting preceding the vote, May said she understood the reasons for which Tory MPs were concerned about her leading the party into the next election. 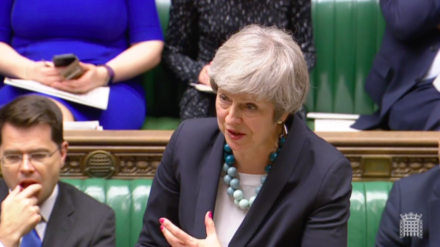 The Prime Minister also promised Conservative MPs that she would find a “legally binding” solution to the Irish backstop, which is widely considered to be the sticking point in her Brexit deal.